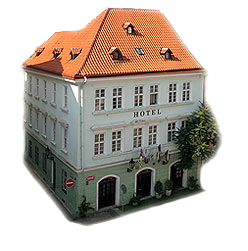 Betlem Club Hotel is located in the heart of Old Town Prague. Charles Bridge and Old Town Square are just a 5 minute walk away. Nearby are Hradcany, Prague Castle, the Jewish Quarter, the Royal Way, Bethlehem Chapel and many other landmarks of the Old Town of Prague. Old Town Prague, containing the Jewish Quarter, (Czech: Staré Město Praha) has been called City of Prague or Old Town of Prague is a historical part of Prague located on the right bank of the Vltava River and including parts of Prague 1 and Střelecký Ostrov (Shooter’s Island). Settlements in the Old Town date back to prehistoric times - the first archaeologically documented settlement dates back to 7 thousand years ago when the Celts and Germans settled there and from around the 6th century when the Slavs settled on the bank of Vltava. In the place where St. Vitus Cathedral and Prague Castle now stand on the headland above the Vltava named Žiži, was a princely stone throne on which the enthronement ceremony took place for the elected Czech princes. In the 10th century it was the center of the Old Prague Premyslid Christian state. During the 12th century, there was already a number of stone buildings and some of the first stone bridges. In the 13th and 14 century burgesses and guilds increasingly gained power and influence, which ultimately lead to the building of Old Town Hall on the Old Town Square , on which stands the famous Old Town Prague Astronomical Clock. In the 14th century Charles IV founded the New Town of Prague called Lesser Town (Czech. Malá Strana) today. Some of the less wealthy burghers moved here and at the end of the 14 century, the Old Town became the center of the reform movement, led by Jan Hus, Jerome of Prague and other university masters. In 1784, during the reign of Joseph II, the separated Old Town became part of the Royal Capital City of Prague. In history Old Town Prague had a number of rights and privileges. The townsfolk of Old Town Prague, for example, controlled the entire Charles Bridge, which connected the Old and New Town. Here they collected duties and taxes on goods from the Jews and even today, there are many expensive and prestigious pieces of real estate in Old Town. Among the greatest sights of the Old Town is Old Town Square, where the Old Town Hall sits with its famous Astronomical Clock. Old Town and Lesser Town are connected by Charles Bridge. Royal Route, around which are the most famous landmarks, leads from the Powder Tower to Celetna Street, the Old Town Square, Karlova Street and then to the Charles Bridge, where it continues through Lesser Town to Prague Castle. Old Town has a unique atmosphere of mysticism and history with its Gothic and Baroque churches, historical buildings and winding streets.